Located near the Fry Mountains, this fenced Area of Critical Environmental Concern (ACEC) contains nearly yucca clone rings of yucca (yucca schidigera) plants. Each ring started from a single plant possibly as far back as thousands of years ago and is a natural clone of the original. As the rootlets from the existing yucca plant sprouts and grows immediately next to it, the ring is formed over long periods of time. For more information on yucca rings, click here. 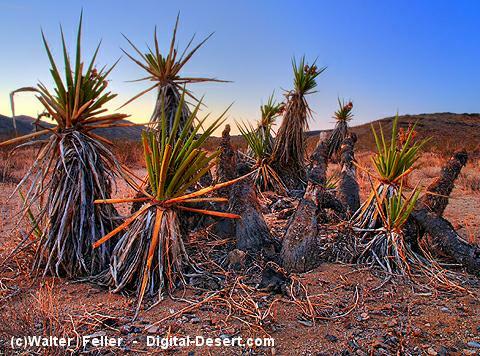 For more information about the Mojave yucca, click here.